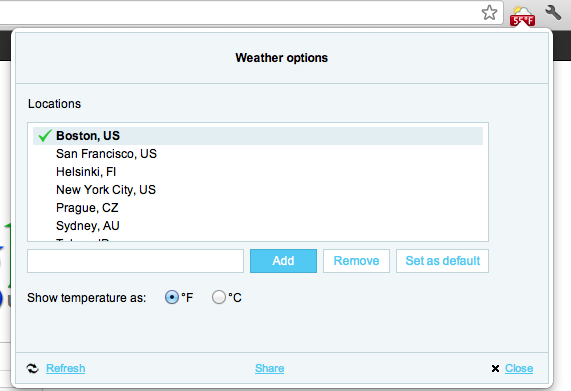 Weather now - The best weather extension for Chrome. That's what I call interesting article. Has ever happens to you that you woke up, you look outside the window and say to yourself: “Today it is going to be really hot.” Than you take some thin clothes and go outside, when suddenly you realize that it is really cold out there and during the day, it starts to rain. Well this won’t happen to you again, if you install Weather now. 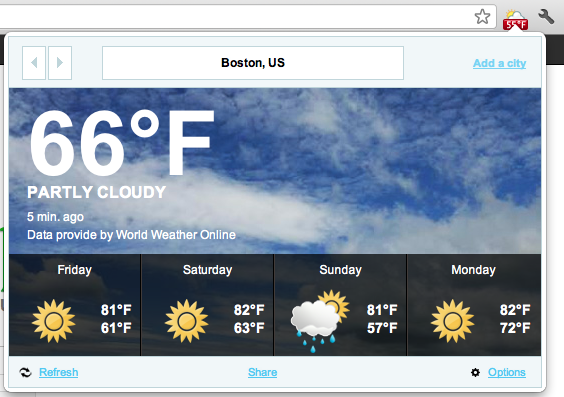 Immediately after launching your browser you can see the actual temperature outside. If you click on the icon, you can see more information about current weather conditions and also the 3-4 days weather forecast, depending on the availability of the sources in your area. • Eye-catching, elegant and simple design - „We put a lot of effort do design of our extensions. It should be catchy and useful. It should give support while using it, not trouble. • Simple enough for any user - „A lot of extensions these days are too complicated, so the computer unskilled users aren’t able to use them easily. • Including languages English, Deutsch, French, Spanish and Russian, Czech and Slovaka and we are planning more. Or the Firefox Add-on here.